The following questions will explore mummification, pyramid building, King Tut’s curse and cats in ancient Egypt. Using the suggested internet sites, research the questions and hand in your completed answer sheets by the due date. 1. Mummification: Use the websites listed below to answer the following questions. Egyptian Mummies | Two Stages of Mummification - click on both the embalming and the wrapping link. 2. Pyramids: Use the websites listed below to answer the following questions. 3. King Tutankhamen’s Curse: Use the websites listed below to answer the following questions. 4. 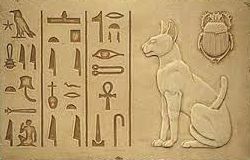 Cat’s in ancient Egypt: Use the websites listed below to answer the following questions.